Backyard Parties, Corporate Events, Sports Presentation Days. This is often hired at stadiums as it complies with height restrictions. 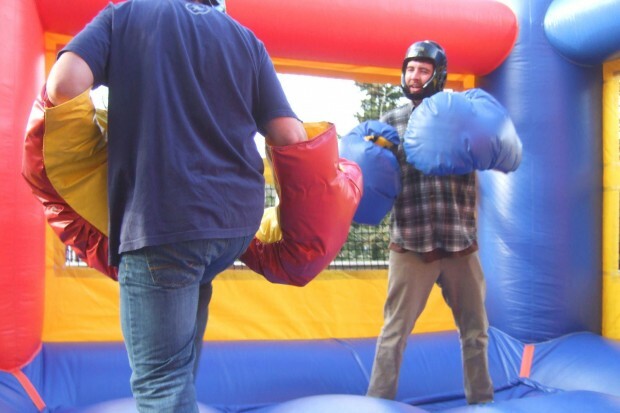 Let’s get ready to rumble… in our Bouncy Boxing Ring with oversized gloves! It takes 34 muscles to frown but only 4 to punch. It may take you a few more muscles to punch with our heavy gloves, but there will be nothing but smiles and laughter. 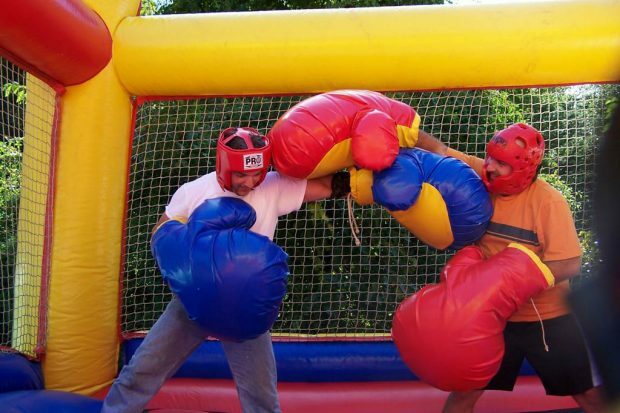 The extra large, super soft but heavy boxing gloves slow down the pace of the match and make it a hilarious event for spectators. But if you have our gloves on, it will be an incredible work out because they are a bit big, heavy and a little fun and awkward to manipulate. This inflatable boxing ring measures 5m x 5m and all participants wear protective helmets for safety designed to protect the head. Last more than 3 minutes in the ring to show your stamina! If you want an amazing event, book the Bouncy Boxing Ring today. 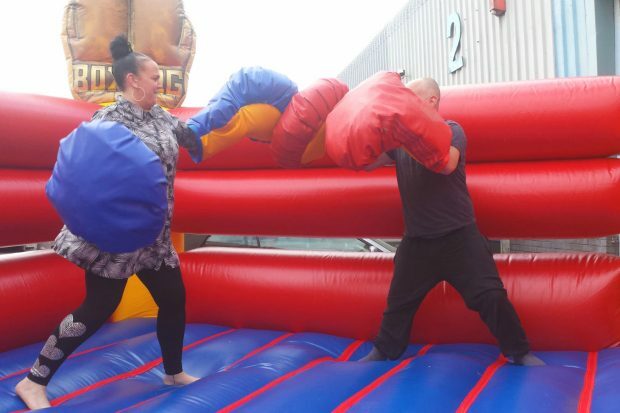 Customers often hire the bouncy boxing ring for backyard parties, corporate events, engagement parties, bucks & hens parties, company picnics & sporting presentations. Looking for an item for more than two people at once? See our Beach Volleyball Arena or adult jumping castles. Seriously good jumping castles, water slides, obstacle courses and interactive games. Seriously great value! Give us a try. Phone: (02) 9829 8929 © 2010-2016 Bucking Events – ABN 59366416863.